Living in the sandy Sunset District in the 1940s and 1950s. by James O. Clifford, Sr.
My son and his two young children recently visited the Cliff House and the ruins of the Sutro Baths, both located just a few miles from where I grew up in the post-World War II years. Footprints in Sunset District sand dunes, about 1922. - Courtesy of a private collector. "Gee, Dad," he said in a call from his home in the East Bay. "It must have been great to be a kid out there." Suburban born and raised, he has no idea how good it was. Those times can never be duplicated, unless you demolish hundreds of homes, cart away the ruins and convert the land into a massive playground. If there is a real "Sons of the Desert," the men's club parodied in Laurel and Hardy films, then I want to join. 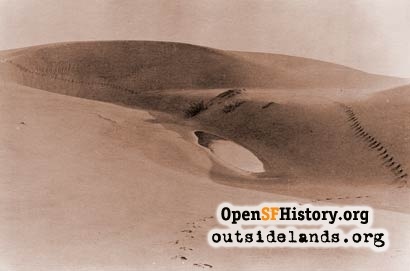 I was truly a son of the desert of sand dunes that once formed a checkerboard in San Francisco's Sunset District. My son's call made be realize there must be a dwindling number of us, so I wrote down some memories of a childhood in which mothers ordered their offspring to "empty your shoes" before entering the house. If the warning was ignored, a load of sand would be brought inside the house in what, in those days, were called by the generic name of "sneakers." I drove to the old neighborhood in an attempt to recall those days, but there's really nothing there to conjure up the freedom I had as a 10 year old, just the opposite. Some of the windows and doors had bars, something that would have been unthinkable in the late 1940s on the 2600 block of 45th Avenue. There was one thing, however, that reminded me of my youth. A small brass kickplate was at the bottom of the front door of my family's old home, put there in 1950 or so, not for people, but for our dog Gyp. Gyp scratched at the door when he wanted to get in; with the plate in place my dad didn't have to paint the door so often. There were only four homes on our end of the street when my family moved in about 1947. All were so new you could smell the paint. Another four were at the other end. In between was just sand, that within a decade would be covered with other homes like ours - two-story and built right next to each other. Until then, Gyp, I and the rest of the kids and dogs lived an alternate lifestyle right out of Huck Finn. We'd pretty much come and go as we pleased. The rule for me was "be in when the street lights come on." Looking back on it, I can understand why parents felt so at ease. All they had to do was look out the back window to see where we were. If memory serves, there were at least four-square blocks of sand stretching to the east with similar acreage in the northeast, a panorama broken only by a few streets and occasional groups of homes that formed enclaves like the one I lived in. There was no sand on the other side of our street. It was lined with homes, some dating back to the 1920s. This unbroken line of homes to the west, however, lasted for just three blocks. Then there was plenty of sand again - at Ocean Beach. The San Francisco Zoo was just a block south. And, if we wanted to travel a bit, the old Sutro Baths and Playland, with its great roller coaster, beckoned. However, it was the sand lots that captivated us. In the sand, we dug trenches and foxholes and flipped coins to determine who would be "us" and who would be the enemy as we reenacted "Wake Island" and "Sands of Iwo Jima." There were also peaceful pursuits. We dug shallow, grooved roadways for tennis balls, complete with tunnels. The object was to see whose ball would travel the farthest while still in the roadway. This was no easy task. The more momentum the ball gathered the easier it was for it to fly out of the groove. This paradise soon disappeared with the coming of new homes. We kids adjusted pretty well by ignoring the no trespassing signs and playing in the houses while they were under construction. We'd chase each other through the framing, making it to the top story where we leapt into space, landing in the soft sand. But the end was inevitable with the growth of the City. You can't stop progress. We didn't know how wonderful we had it. James O. Clifford Sr. grew up in the Sunset District. Page launched 6 May 2009.